Benny Goodman Carnegie Hall Concert 80th Anniversary Party! 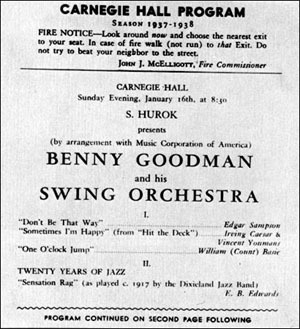 January 16 marked the 80th anniversary of one of the most famous and monumental concerts in jazz history - Benny Goodman and his Orchestra at Carnegie Hall! DJ Ryan Swift will be playing the same tunes the Goodman band played on that legendary night, and DJ Ian Hutchison will be mixing it up during the "intermission" with a mix your favorite swing tunes! Check out this conversation with Jazz @ Lincoln Center for some history, and then come swing out at Fram for a great night of jazz!